Everyone loves a good story, and the team here at The Conservation Center is no exception. 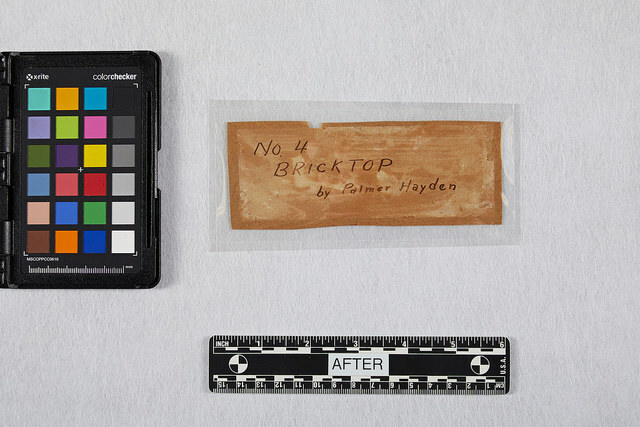 When a watercolor by Palmer Hayden recently came to us for conservation, we knew a fascinating history would come along with it. The story behind the piece began in 1931, when Dr. James Vincent Sparks walked into an art show in Paris and became awed by the painting of a man serenading a woman. He bought the piece directly from the artist, Palmer Hayden, and it became a cherished heirloom in Dr. Sparks' family for generations. Palmer Hayden was born January 15, 1890, in Widewater, Virginia. Although his artistic talent was apparent early in his life, he didn’t formally attend art school until after serving in the military during World War I. When he returned to the states, Hayden studied at the Cooper Union School of Art in New York City, where he was greatly influenced by the Harlem Renaissance. Hayden then attended the Boothbay Art Colony in Maine, and later the École des Beaux Arts in Paris. He exhibited many times in Paris, including at the American Legion Exhibition where he sold his painting Bricktop to Dr. Sparks. Bricktop is named after the woman depicted in the painting, who went by the nickname because of her red hair. Bricktop, originally from Chicago, lived in Paris throughout the 1920s and was known as one of the top nightclub performers of the city. In this painting, she is shown wearing a plain blue dress and sitting on a couch next to the serenading man. When this work came to The Center, our conservators noted that the painting was solid mounted to an acidic paper board. The work exhibited moderate surface soil throughout, as well as distortion due to exposure to high levels of moisture. The sheet had begun to selectively delaminate from the mount along the bottom edge, and there were minor losses at the lower right corner. The piece also exhibited evidence of insect damage and scattered abrasions throughout the surface. There was a water stain at the bottom edge and hide glue stains located along the top left edge. The verso of the board exhibited a sheet with the artist's signature and date. The sheet was very thin and embrittled with signs of insect migration throughout. Our conservators began by mechanically removing the watercolor from the acidic mount. The sheet with the artist's signature was also mechanically removed and encapsulated. After surface cleaning the watercolor, the adhesive residue on the verso was carefully swabbed away. The piece was then humidified and flattened to reduce distortion as best as possible, and tears were repaired with Japanese tissue and wheat paste. Finally, per the owner’s request, our team gave the painting a new mat and frame. The piece was float mounted and assembled with UV Plexiglas, a conservation-grade acrylic glazing that protects against UV light rays. The watercolor was then framed in an antique-style walnut frame with an acid-free Coroplast backing board for extra protection. It will now hang proudly in the owner’s home, where we are sure its story will be told for years to come. Palmer Hayden, 1932. Unidentified photographer, from Palmer C. Hayden papers, courtesy Archives of American Art, Smithsonian Institution.